It is estimated that 80% of people in the UK will be affected by back pain at some point during their life, and if you are one of those people you will be aware of the impact it has on everything you do. There is constant pressure and stress placed on your back during every movement and even when you are sat still meaning back pain is the second most common reason for sick days in the UK. The easiest way to deal with your back pain would be to rely on medication to reduce the pain. Good news in the short term but extended reliance has numerous problems for your health and can lead to problems with addiction. Painkillers fail to ever address the causes of your pain, they just mask over the problem. The experts at BackRack found 98% of back pain is linked to the compression of the spine (when your spine becomes squashed or shortened). This puts the balance of your spine and all the surrounding joints, muscles and tendons under added stress which causes back pain. BackRack is a unique product for the treatment of back pain. Endorsed by world top spinal specialists and incorporating worldwide patented technology, it is truly a stand-alone product in back care. BackRack tackles the cause of you back pain instead of masking the symptoms like other products, so you can expect lasting results helping you avoid the need for more aggressive forms of treatment, such as surgery and heavy painkillers. 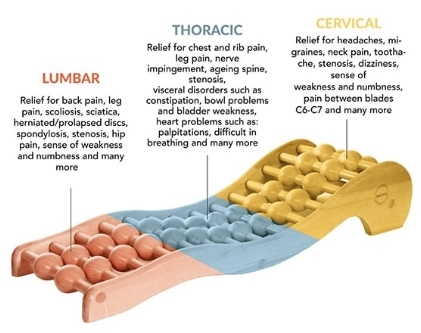 BackRack works directly on the cause of back pain by decompressing your spine. When you lay on the BackRack your spine is suspended and nodules on either side push up the individual vertebrae causing them to pivot. As a result, the joints are decompressed, and the spine lengthens. Pain is reduced, and mobility is increased. The design of the BackRack mirrors the natural curvature of the spine so it is fully supported when using it, making it totally safe to use without causing further problems. BackRack is constructed from high quality, ethically, sourced wood to ensure it is stable and safe to use when all your weight is on it.